Doncaster Knights boss Clive Griffiths has mixed feelings about another blank weekend. It is the second time in the last month that Knights, along with most other Championship clubs, are without a game. “Having got back to winning ways by beating Moseley last Friday, you want to keep the momentum going,” said Griffiths, whose side have just two more league games to play before making their debut in the Promotion Play-Offs. Full-back Paul Jarvis, wing Dougie Flockhart, prop Colin Quigley, recent signing Davis Mcllwaine and No 8 Ollie Stedman have all missed recent games and Griffiths is hoping to have a number of them back on board before the club make their bid for the Premiership. “Stedman, for one, will be available for the Bedford game on Saturday week unless he picks up an injury in training in the meantime,” said Griffiths. 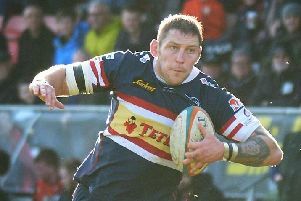 The game could be Stedman’s last appearance in a Doncaster shirt at Castle Park as a result of his decision to join Yorkshire Carnegie next season. Griffiths said that he would assess the situation nearer the time as to whether he would consider Stedman for selection were Knights, as is looking likely, to meet the Leeds-based club in the play-offs.